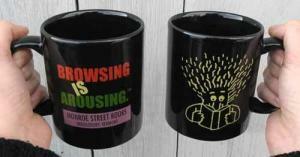 The Monroe Street Books™ glossy black ceramic mug. Nothing better to go with your book than a steaming hot cup of coffee, tea, hot chocolate, or drink of your choice.Monroe Street Books‚Ñ¢ and Monroe Street Books*, Middlebury VT printed on one side, our famous “browsing man” on the other. *”Middlebury has an array of good bookstores including Monroe Street Books, a world-class used-book store, with more than 80,000 titles in store and another 50,000 off-site….” The Wall Street Journal, July 16, 2009.